Four teenagers have claimed the top prize in a technology pitching competition. The collective team of Martyna Eron from Wellington College, Gráinne Camplisson from St. Louise’s College, Ryan Bell from Hazelwood Integrated College and Jess Bell from Active Communities Network were the winners, having impressed the judges with their novel concept. They will now have the opportunity to undertake a VIP journey to Dublin to meet with some of the world’s biggest companies in the tech sector. 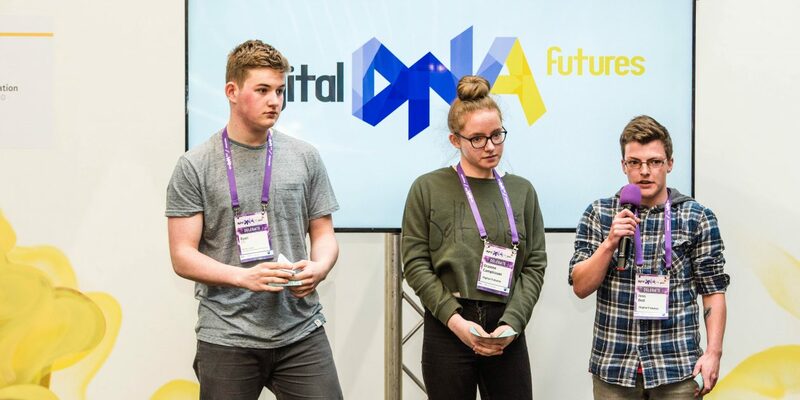 The foursome took the top prize in Digital Futures, a programme organised by Digital DNA, which assists 40 teenagers aged 16 – 18 years old in realising their potential and the opportunities available to them within the digital and tech sectors, as well as encouraging them to make a positive impact in their community. “The importance of technology in today’s world is continually highlighted – and rightly so. It is encouraging to see a collective of individuals band together to pitch in front of not only their peers, but industry professionals, and express themselves and their ideas. The digital and tech world has been able to bring an incredible wealth of opportunities right to the doorsteps of our young people. “Congratulations to Martyna, Gráinne, Ryan and Jess. Their pitch about was truly inspirational and I hope to see it come to fruition someday! Mental health is such an important part of our young peoples’ wellbeing and it is refreshing to see these teenagers take it seriously. Those undertaking the programme had the opportunity to meet with potential employers, including PwC, and Digital Futures will be assisting them with further work placements and career opportunities.